Father Julián Carrón wrote to members of CL on the election of Pope Francis as the Bishop of Rome. Within the irrepressible joy of having a new guide for our community of believers, I am struck by how he managed to communicate to us, from his very first movements, with simple gestures comprehensible to everyone, where his gaze is fixed. With his choice of name, Francis, he shows us that he has no other wealth but Christ. He trusts no modality of communicating this if not plain and simple witness to Christ. Pope Francis’s disarming request expressed the awareness that this witness is pure grace and that we must beg for it: “I ask you to pray to the Lord that He will bless me.” In the Pope’s prayer, together with the crowd in St. Peter’s Square, the miracle of the life that is the Church–whose heart is Christ Himself–took shape before the eyes of the world. I am struck by the profound harmony, founded on faith in Jesus Christ, between the realism of Benedict XVI, who with his gesture reminded the world that the Church is Christ’s, and the humble realism of Pope Francis, who immediately expressed the consciousness of his ministry as a Bishop in communion and on a journey with the people of the Church of Rome, “which presides in love over all the Churches,” according to a fitting expression by the great Saint Ignatius of Antioch. Moved by the invitation to start the journey together, Bishop and people, we ask Our Lady to grant each of us the abandonment to Christ that Francis witnesses to us in this moment. 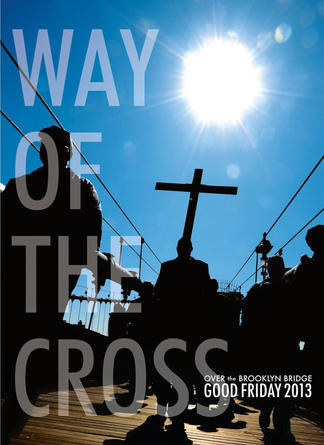 Since 1996, Communion and Liberation, an ecclesial movement in the Catholic Church, has organized the Way of the Cross over the Brooklyn Bridge. With God’s grace, year after year the event has grown — thirty people became a hundred, two hundred, three hundred, four hundred, a thousand, until, at last year’s Good Friday thousands New Yorkers followed the Cross all the way to Ground Zero. It thus gives me great joy to invite you to participate in this year’s Way of the Cross over the Brooklyn Bridge to Ground Zero. The event begins at 10am on Good Friday – March 29, 2013 – at St. James Cathedral-Basilica, 250 Cathedral Place (corner of Jay and Tillary Streets) and it will conclude at 1:30pm so the participants can attend the Good Friday service in their parish. The cathedral can be reached by taking the A, C, or F train to the Borough Hall Stop in downtown Brooklyn. After a station on the Brooklyn Bridge, the procession will follow the cross to a third station at City Hall Park in Manhattan, and a fourth station near Ground Zero. The final station will be at St. Peter’s Church on Barclay Street, concluding at 1:30 pm. At each station, there will be readings from the Passion, a meditation, a reflection and hymns. All are invited to participate. For more information, please call Communion and Liberation at (212) 337-3580 or visit the website. Indeed, “It would be foolish to act as if nothing happened” with the abdication of a pope, and much more since it was Benedict XVI. While I am not completely surprised by his gesture of love for the Church, I am saddened that he’s exiting stage left because I have come to rely on him as a credible witness of how to live my Christian life with vigor. Editorials are flying around faster than the wicked witch: some are very worth reading and some not. One would swear that the commentators have never read a word that Razinger wrote or truly observed a gesture of Benedict XVI. But won’t realize this until you digest what’s said. Let me offer an editorial from La Repubblica (February 15, 2013) written by Father Julián Carrón, President of the Fraternity of Communion and Liberation. “Ratzinger’s Cross” gives reasons of true Hope. What was capable of filling the entire world with silence, all of a sudden? That astonished moment destroyed, in one stroke, the images that we normally have of Christianity: a past event, an earthly organization, a group of roles, a morality about things that we should or shouldn’t do… No, all of this cannot give adequate reasons for what happened on February 11th. We must look elsewhere for the explanation. Therefore, faced with the Pope’s gesture, I wondered: Will anyone ask themselves who Christ is for Joseph Ratzinger, if the bond with Him led him to carry out an act of freedom this surprising, which everyone–believers or not–recognized as exceptional and profoundly human? Avoiding this question would leave the event without an explanation and, what is worse, we would miss the most precious part of what it witnesses to us. It cries out, in fact, just how real the person of Christ is in the life of the Pope, how much Christ must be contemporaneous and powerfully present in order for him to generate a gesture of freedom from everything and everyone, an unheard-of novelty, so impossible for man. Full of wonder, I was then forced to shift my gaze to what made it possible: Who are You, who fascinate a man to the point of making him so free that he provokes the desire for the same freedom in us, too? “Christ in His beauty draws me to Him,” exclaimed another man passionate about Christ, Jacopone da Todi. I haven’t found a better explanation. With this gesture, as imposing as it is unexpected, the Pope witnesses to us such a fullness in the relationship with Christ that he surprises us with an unprecedented act of freedom that puts the good of the Church before all else. Thus he shows everyone that he is completely entrusted to the mysterious design of an Other. Who would not want a freedom like this? The Pope’s gesture is a powerful reminder to renounce every human security, trusting exclusively in the strength of the Holy Spirit. It’s as if Benedict XVI said to us, in St. Paul’s words, ‘I am confident of this, that the one who began a good work in you will continue to complete it until the day of Christ Jesus’ (Phil 1:6). Through the Pope’s announcement, the Lord asks us to pierce through all appearances, going back through all of the human enthusiasm with which we greeted Benedict XVI’s election and with which we have followed him in these eight years, grateful for every word of his. We, too, desire to live the same experience of identification with Christ that dictated this historic act for the life of the Church and of the world to the Pope; and so, it is with freedom and full of wonder that we receive this extreme gesture of paternity, carried out for love of his children, entrusting his person to Our Lady so that he may continue to be our father, giving his life for the work of an Other, that is, for the edification of God’s Church. 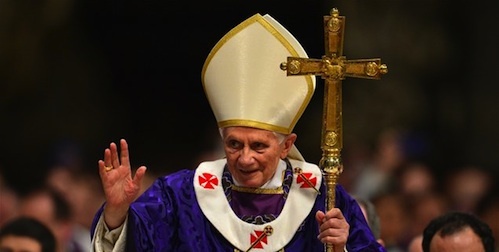 With all of our brothers and sisters, together with Benedict XVI, we ask the Spirit of Christ to assist the Church in the choice of a father who can guide her in a historic moment that is so delicate and decisive. 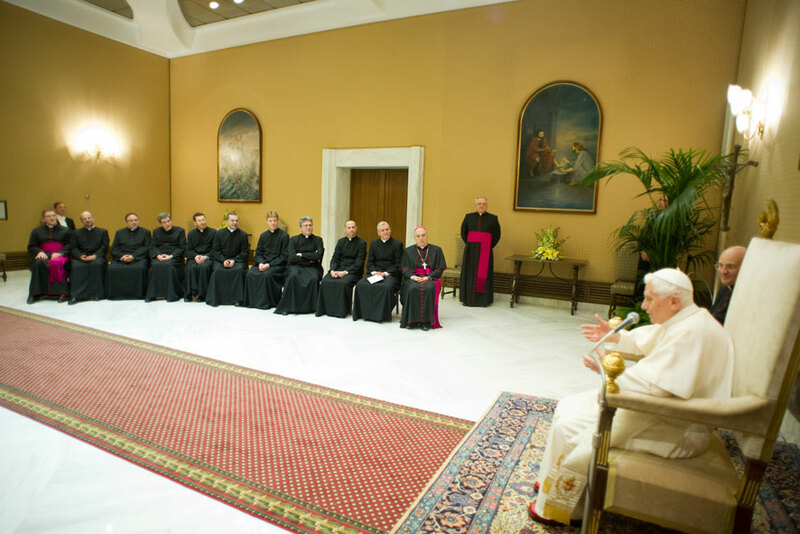 At the end of the Pope’s General Audience on Wednesday, 6 February, Benedict XVI received in the Paul VI Hall the participants of the 12th General Assembly of the Fraternity of Saint Charles Borromeo. They had just elected a new Superior General, Father Paolo Sottopietra, 45. Father Sottopietra is the second Superior General following the founder and Superior General the Most Reverend Massimo Camisasca who was ordained bishop for the Diocese of Reggio Emilia on 7 December. Camisasca served as the leader for 27 years. The Fraternity developed from the charism of the Servant of God Father Luigi Giussani and the ecclesial movement Communion and Liberation. Present at the papal audience were Bishop Massimo Camisasca, FSCB and Father Julián Carrón. It gives me great joy to be with you. I remember well my visits to Palazzo Borromeo, next to St. Mary’s Major Basilica, where I personally met Fr. Giussani; I have known his faith, his joy, his strength and the richness of his ideas, the creativity of his faith. A true friendship developed between us; and so, through him I got to know even better the community of Communion and Liberation. And I am glad that his successor is with us, who continues this great work and inspires so many people, so many lay people, men and women, priests and laity, to collaborate in spreading the Gospel and the growth of the Kingdom of God. And among you I have also had the opportunity to get to know Massimo Camisasca; we have talked about different things; I have gotten to know his creativity in art, his ability to see, to interpret the signs of the times, his great gift as a teacher, a priest. I once even had the honor to ordain some priests in Porto Santa Rufina, and it was nice to know that here a new Priestly Fraternity is arising in the spirit of St. Charles Borromeo, who always remains the great model of a Pastor who is truly stimulated by the love of Christ, who seeks out the small, who loves them and so truly creates faith and builds up the Church. Now your Fraternity is large, and it is a sign that there are vocations. But there is also a need to be open to finding, accompanying, guiding and helping vocations mature. This is the thing for which I thank Don Camisasca, who has been a great educator. And today, education is always important to the growth of the truth, for us to grow in our status as children of God and brothers of Jesus Christ. Now, thanks be to God, I have also known for a long time your new Superior General, who has also been in touch somewhat with my theology. So, I am glad that I can be spiritually and intellectually with you and that we can offer fruitful help to each other through our work. May the Lord bless you all. I thank the Lord for this gift of your Fraternity: may it grow and deepen always, even more in the love of Christ, in the love of men for Christ. The Lord accompanies you.